Life is about special connections. The North Shore CONNECT Townhomes at Nature’s Edge is a new boutique townhouse development in beautiful North Vancouver. 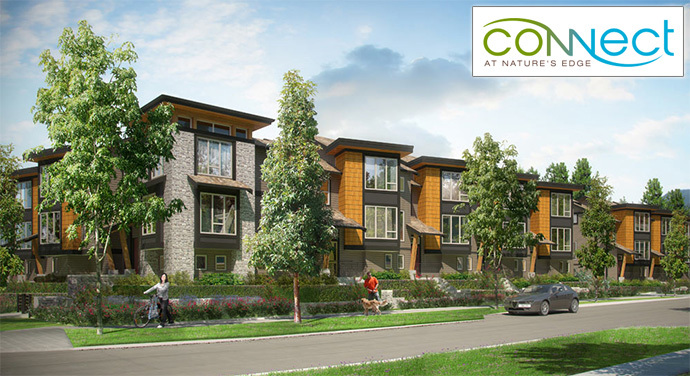 Featuring only 32 distinctive 3 bedroom townhouses and nestled in the vibrant neighbourhood of Lynnmour North Vancouver CONNECT at Nature’s Edge offers home buyers a rare and very special opportunity for an extraordinary lifestyle. The spacious Craftsman homes are surrounded by nature and outdoor amenities of the North Shore, with shopping, urban amenities and services just around the corner. Connect to life at its very best. The new North Vancouver CONNECT Townhomes at Nature’s Edge are priced attractively from just the low $600,000’s. The safe and welcoming community are close to the North Shore mountains in addition to the shops at Park & Tilford Centre. Lynn Canyon Park, the Headwaters and the Seymour Demonstration Forest are also minutes away from your front door. Dining options, great schools and transit routes are also nearby. Whatever you want or need, the CONNECT North Vancouver townhomes are ideally situated for your lifestyle. For more information and to register your interest, please visit www.connectatnorthshore.com. The development is brought to you by Brody Development Group, a trusted boutique builder on the North Shore. The superior craftsmanship features quality grade 2×6 construction with durable and sustainable exterior siding, contemporary wood trimming, moulding and fascia. All windows are double glazed and EnergyStar rated and all homes have a high efficiency natural gas fired hot water on demand system in addition to a heat recovery ventilation system with electric baseboard heating. The CONNECT North Vancouver townhomes also have extra soundproofing detailing and the contemporary West Coast style architecture is designed by award winning Integra Architecture Inc. The meticulous landscaping is designed by Forma Design Inc. and all homes have spacious balconies for entertaining, open lawn areas and more. All homes also come with garage parking, remote control overhead door openers, deadbolt entry locks, rough in for security alarm system, smoke and carbon monoxide detectors and sprinkler systems. The North Vancouver CONNECT at Nature’s Edge townhomes are built to Platinum level Built Green standards and will also incorporate low flow faucets, toilets, Energy Star rated windows and appliances, low VOC paints and drainwater heat recovery system. Here are the well designed floorplans at North Vancouver’s Connect at Nature’s Edge townhouse project by Brody Development Group. All floorplans offer spacious 3 bedroom top floor layouts and plenty of storage room and flex spaces. All Connect North Van floor plans feature double car garages (all but one are side-by-side). Please note that they are in no particular order and the developer reserves the right to make modifications at any time. Please see the sales staff for more details and printouts. North Shore living at its best includes amazing interior features and finishes that any homebuyer would love. Here, Janet Marx interior designer has selected 2 great finishing schemes. The main floor and top floors have 9 foot ceiling heights, and the kitchens, bathrooms and entry have slate or tile floors. The bathrooms have luxurious in floor heating too! The living areas have gas fireplaces and there are privacy blinds on most windows. Comtemporary countertops, soft close hinges and drawer slides for the cabinets, lazy susan, roll out pot drawers, recessed and pendant halogen lights, veggie sprayer and chrome faucet are all standard features at the new Nature’s Edge CONNECT Townhomes in North Vancouver real estate market. Other high-end standards in the kitchen include Energy Star appliances built for efficiency and this includes a self cleaning gas range, bottom freezer/fridge with a pull out drawer, dishwasher, space saver microwave, garburator and double bowl stainless steel sink. Other impressive features are the very spacious bedrooms with some masters having large walk in closets too! The master ensuite bathrooms have heated in floor tiling, acrylic deep soaker tubs and separate enclosed showers with tiled surrounds. The designer cabinetry is finished with polished chrome hardware too. Only 32 new North Shore townhomes are now selling at the boutique CONNECT North Vancouver townhouse project by BRODY Developments. Here, home buyers will find contemporary West Coast architecture and easy living floor plans finished with exceptional attention to detail. The location of the new CONNECT North Shore townhomes is impeccable and they put you and your family front and centre within minutes of the Lynn Canyon Park district, Seymour Demonstration Forest and Deep Cove. In addition, you are just steps away from Park & Tilford Centre for groceries, amenities and services in addition to the rest of the North Shore. Don’t miss out on this rare opportunity to purchase a brand new townhome in North Vancouver Lynnmour neighbourhood, one of the most promising up-and-coming districts in the area. As well, the new North Vancouver CONNECT Townhomes will be priced from the low $600’s. Some of the incredible interior features include gas fireplace and patio barbeque hook-up, nine foot ceiling heights on the main level living areas and fully landscaped yards. The project site of CONNECT North Shore Townhouses is at 757 Orwell Street North Vancouver (at Keith Road). Register your interest online at www.connectatnorthshore.com.